^ Collazo CM, Galán JE (September 1996). “Requirement for exported proteins in secretion through the invasion-associated type III system of Salmonella typhimurium”. Infection and Immunity 64 (9): 3524–3531. PMID 8751894. http://iai.asm.org/content/64/9/3524.long. ^ Jorge E. Galán and Hans Wolf-Watz (November 2006). “Protein delivery into eukaryotic cells by type III secretion machines”. Nature 444 (7119): 567-573. doi:10.1038/nature05272. PMID 17136086. ^ Humphreys D, Davidson A, Hume PJ, Koronakis V (February 2012). “Salmonella Virulence Effector SopE and Host GEF ARNO Cooperate to Recruit and Activate WAVE to Trigger Bacterial Invasion”. Cell Host Microbe 11 (2). doi:10.1016/j.chom.2012.01.006. PMID 22341462. ^ Wendy Higashide, Shipan Dai, Veronica P. Hombs, Daoguo Zhou (june 2002). “Involvement of SipA in modulating actin dynamics during Salmonella invasion into cultured epithelial cells”. Cellular Microbiology 4 (6). doi:10.1046/j.1462-5822.2002.00196.x. PMID 12116966. ^ Hardt WD, Chen LM, Schuebel KE, Bustelo XR, Galán JE (1998). “S. typhimurium encodes an activator of Rho GTPases that induces membrane ruffling and nuclear responses in host cells”. Cell 93 (5): 815-826. doi:10.1016/S0092-8674(00)81442-7. PMID 9630225. ^ Mark A. Jepsona, M.Ann Clark (November-December 2001). 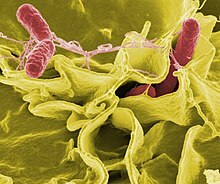 “The role of M cells in Salmonella infection”. Microbes and Infection 3 (14-15). doi:10.1016/S1286-4579(01)01478-2. PMID 11755406.